I've grown tired of kids blindly following rules. Mine have the tendency to be the worst because they have always been really good at playing school. So we went for a different approach to exponent rules this week. Instructions: Choose a rule that you would like to prove (read: demonstrate why it is a rule). As you are able to demonstrate an exponent rule, move downstream to the next group and help with that rule finally working on rule #8. 8. What do you think x1/2 represents? This conversation took about 12 minutes with the camera being shut off a couple of times. I limited the editing so as to try to capture the classroom vibe as naturally as possible. I asked a few questions that I'd like to take back, but... you live and learn. Thank you for taking video!! It is so helpful to see more great rich mathematical conversation! Did you have this small group share their proof with the whole class? Were they able to explain it again? It is clear how the ordering of those proofs set up the direction of the conversation. 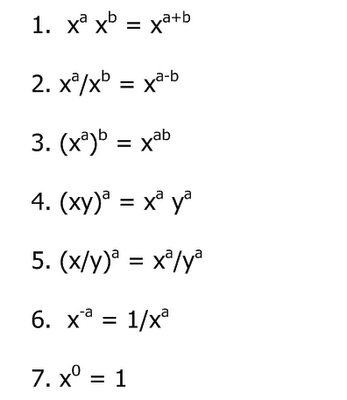 How do you think the conversation would go if you moved the proof for #3 (x^a)^b = x^ab into slot 5. I'm not sure if students would have been more likely to use this rule in their proof earlier. I also wonder if the connection would have come up quicker if we used 4 then 9 then 16 so they can see it's the square root quicker, then go to 3, 5, etc. Did you get to try different orders with different groups of students? What do you give them as the definition of exponentiation? What rules of inference are they allowed? Both are essential to coming up with proofs. I'm not too sure if re-ordering the rules would have made much of a difference. The power of a power follows the product rule nicely, though. I kicked myself for going with 3^5. Bad choice on my part. Looking back I'd probably stick with base 2 then move to 3 and 5. I haven't done this with any other groups as the rest of the class was wrestling with the other rules. I wasn't looking for any kind of formal proof. These kids understand what an exponent is and what it does to a base. In 7th grade they dealt with basic product and quotient rules. As for inference rules, keep in mind that they are in 8th grade and I was merely looking for them to convince themselves why the rules work the way they do. Thank you for sharing this! I really like what is going on at 5:20 in this video. I feel like they are more likely to remember the 1/2 exponent's meaning after focusing on it and really digging. 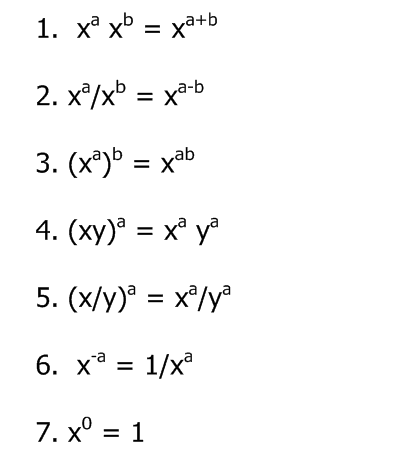 I also think it was interesting how the mis-conception of exponents as linear things (the girl who thought 4^1/2 is half way between 4^1 and 4^0 since 1/2 is halfway between 1 and 0) was brought to the forefront and addressed. I am curious to know if you freely interchange the words 'opposite' and 'inverse' in class or if you use them for specific situations. I would like to share this with some colleagues as well, so I'm going to ditto gas' request for background info and how many were in the small group you were working with (sounded like 3, but voices are hard to tell). We talk about opposites and reciprocals as both being inverses, so I guess within the context of addition, yeah, we use them interchangeably. In my previous post, I gave my classes a problem using the associative, commutative, inverse and identity properties of addition, then asked them to write one using multiplication. The inverse/identity concept was hammered home. The group had four kids in it, one didn't say much. Two are pretty dominant personalities, one speaker is shy but is finding her own and the fourth is a very thoughtful observer. Again, I wasn't really formalizing any kind of proof so I'm not sure if I've adequately addressed the rules of inference question. Let me know if I can clear anything else up.